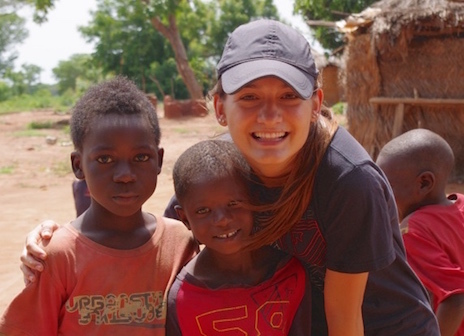 My name is Camille and I was a Saha Global Field Rep in June of 2014. I’m 19 years old, but I spent 13 of those years living and studying outside of the US, where I was born. After coming back to the States to study biomedical engineering at the University of Southern California, I was itching to get back into international work. I found Saha Global through the Engineers Without Borders club at my school and instantly agreed with their commitment to sustainability and women’s empowerment. 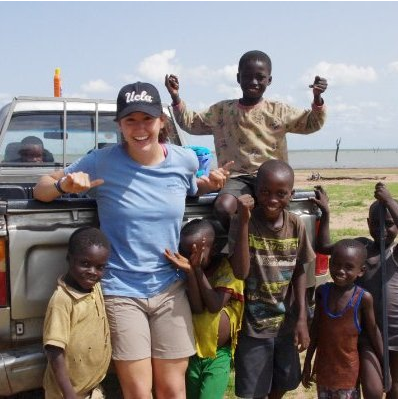 The Saha Global Leadership Program encompassed so many things that are so important to me such as health education, water crisis awareness, and cultural exploration. 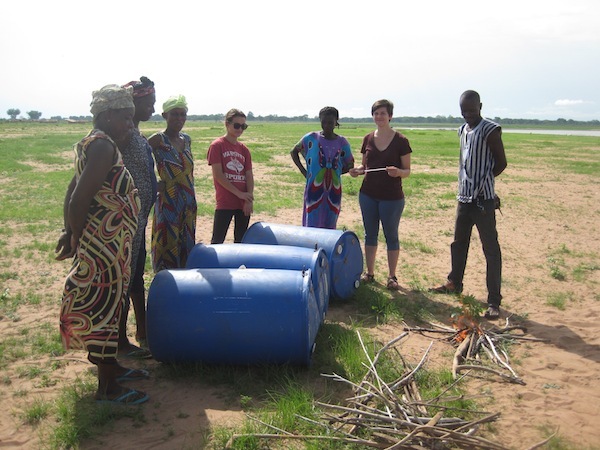 Through attending this program, I learned about the culture and people of Ghana as a resident as opposed to simply as a tourist. I worked in the village of Sabonjida for three weeks while living in a compound in the town of Salaga with seven other field reps and our leader. 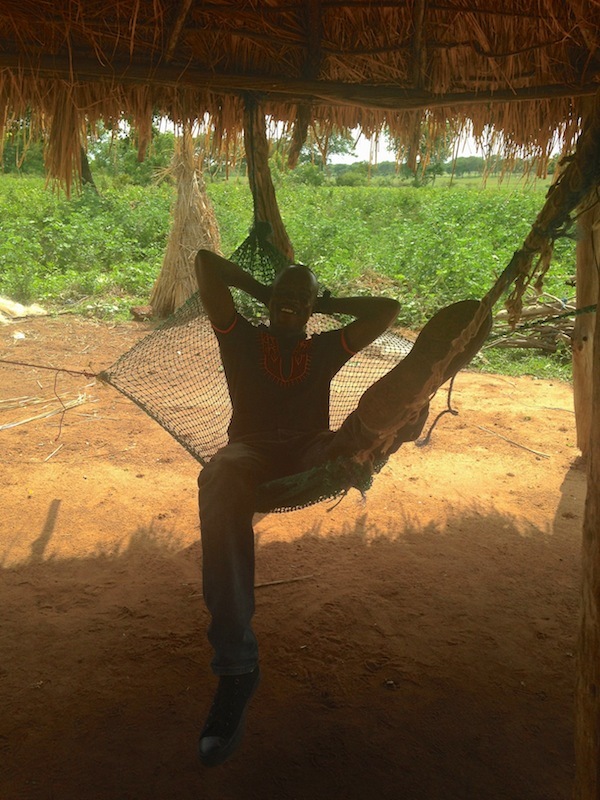 Shopping for groceries in the local market and spending long days by the shore of Lake Volta gave me a true understanding of how my colleagues in the village live. I can already tell that the skills I acquired while working in the Saha Global Leadership Program will be invaluable to me in the future: tolerance, public speaking, stamina, and culinary creativity are just a few. I remember being shocked at first by our drastic cultural differences, but soon overcoming them to bond deeply with the women that we worked with. My favorite memory from the trip was when we were collecting the water for our first round of treatment at the center. My Saha Global team and I struggled carrying small buckets of water while the village entrepreneurs, Mary, Florence, Elizabeth, and Mercy, carried large tubs of on their heads without breaking a sweat. Though we could not speak the same language, the eight of us had the best time as the field reps attempted to keep up with the women we were supposed to be training. Since returning home, it has been comforting to be able to keep updated on the successes of the entrepreneurs in Sabonjida. This experience further intensified my interest in international development work and I look forward to following, and hopefully being involved in, future Saha Global projects. Want to learn more about Camille’s experience or have any specific questions? Camille would love to tell you more! Feel free to email her at clconner@usc.edu Also take a look at what she’s up to now! Voices from the Field: Team Peter! Hey everyone! It’s team Peter here today. We are Josh, Camille, Brandee, and Claire. We’ve been braving the “road” to Sabonjida for four days, picking up pedestrians and hoping we don’t get a flat. The journey is about an hour and fifteen minutes each way, and despite the quotation marks around road, not too bad of a trip except a stretch where rain runoff exposed the bedrock. Once we get in to Sabonjida the view of the lake and surrounding countryside is well worth braving the road. Sabonjida is a fishing community of about 70 households on the northern coast of Lake Volta. The majority of the people speak Ewe as their first language, but we communicate with them through Peter in Twi. On our first day in the village we met Clint and Haley of Mercy Project. 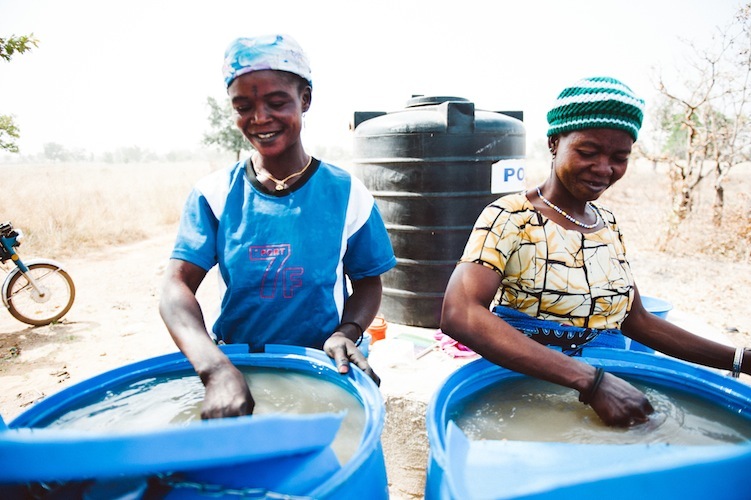 They first called CWS’s attention to Sabonjida as a village in need of clean water. They have been working in Sabonjida to address the root causes of child slavery on Lake Volta. You can read more about their approach and what they’re all about on their website. 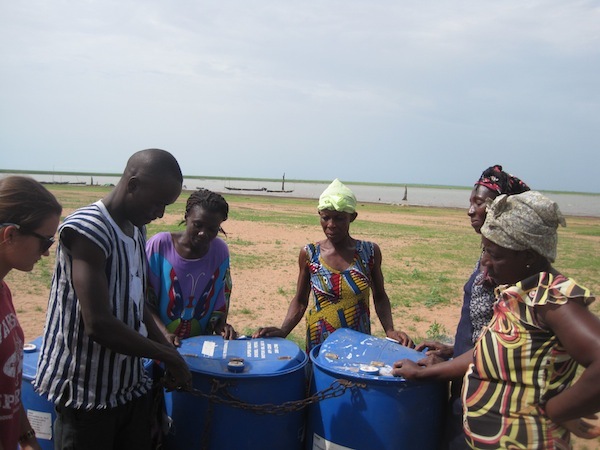 The newly selected women check out the 200 L blue drums they will use to treat Lake water with alum! The first person we met when we got into the village was Mercy. She has shown us abundant hospitality each time we visit, offering food, bringing us chairs and being helpful in any way she can. In addition, she has had a very strong presence in all the meetings with community leaders. This makes us very optimistic for the future of Sabonjida, as she will be one of the four women running the water treatment center there. The other three women the community selected are Florence, Mary, and Elizabeth. We look forward to getting to know them better when we train them over the next few days. One thing that was disconcerting to see was during the community meeting when a woman had a question she initially addressed one of the men. Since they were speaking Ewe, a language Peter does not understand, it was hard for us to know whether it was legitimate question or if they were simply asking for clarification from a man sitting near them. After a little encouragement they began to speak up directly and we hope this trend continues as they see their friends in roles of power and respect within the community. 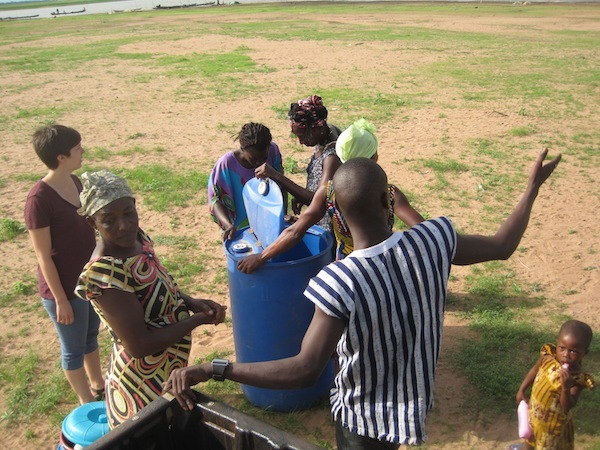 Camille, Peter, Mercy, Mary, Florence and Elizabeth setting up the water treatment center. Lake Volta in the background! 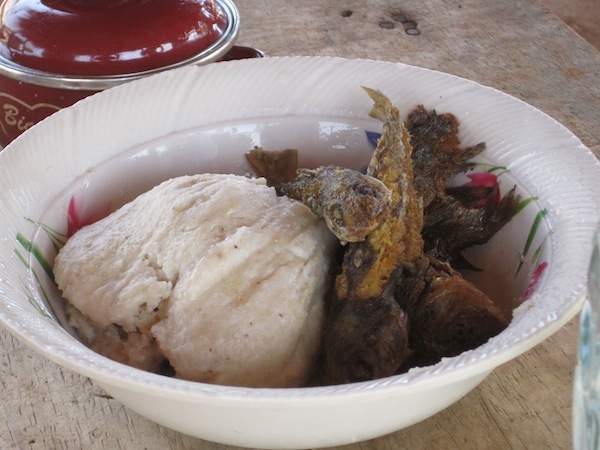 Kenkey and fish (Peter’s fav) made by Mercy! The concerns raised in the community meeting were largely centered on the nuances that come with living in a fishing community. One major concern was the mobility of the center given that Lake Volta is prone to flooding at the combined discretion of Mother Nature and the people in charge of regulating the dam that maintains it. We explained to them that their polytank would be lifted up on a metal stand that can be moved according to their needs. Another concern was the irregularity of their income. Since most of the community fishes they might not have cash on hand, even though they have plenty of fish in net. To address this concern we explained to them that the ladies running the center had the liberty to run the business whichever way is most conducive to getting everyone clean water. In Tunga, a community we monitored on Wednesday, the woman entrepreneur had a system of giving out interest free credit or accepting payments in advance in order to give everyone access to clean water, and we relayed this idea along to them. Peter hanging out in a fishing net hammock! Brandee, Camille, Peter, Mercy, Florence, Elizabeth and Mary building a fire to heat up the screws in order to more easily screw them in to the plastic 200 L blue drums! There was another unfortunate yet encouraging issue that came to light during the community meeting. There happened to be an old man from a neighboring community at the meeting who wanted to know why we were doing this project only for Sabonjida when the lake water is unhealthy for all the communities who drink it. We had to explain to him that although CWS aims to continue implementing clean water businesses all around Lake Volta, we unfortunately can only reach one community at a time. However, we were excited by his approval of our project and excitement for when CWS might reach his village. We were also very encouraged by the community’s questions about how they would access clean water while traveling, which preliminarily implies that they accept the idea of always drinking clean water when they are at home. Our plan for the next two days is to train our four women to treat the water and become the entrepreneurs of the water center!